It´s most likely that all of us will be affected by a nightmare at one point or another. But they are most common in preschoolers (children aged 3-6 years) because this is the age at which normal fears develop and a child’s imagination is very active. Studies estimate that as many as 50% of children in this age of 3-6 have nightmares significant enough to cause distress with everyday life, learning progress and affects their ability to sleep. With this project I wanted to empower children to cope with their nightmares by reimagining the way we support them today. I wanted to provide a long term strategy that helps them take control over their fears and prevents an over-dependency to teddybears or comforting blankets to fall asleep. With participatory workshops, I was able to do several user tests and interviews with families. I had close contact with researchers in the field to confirm my insights so I could prototype and evaluate the concept. Dream Play-Reimagining the way we support children today and how they cope with their nightmares. Developed as an engaging application, Dream Play motivates and supports children to draw and communicate even the most abstract dreams to their parents. Dream Play stimulates their imagination and encourages them to recreate a less frightening outcome for their nightmare. By providing a physical way for children to change the outcome of their nightmare, they can mentally rehearse and imagine how to take control of their fears. As a result, the child learns to use imagination as a powerful, life-long tool to overcome their nightmares in a playful way. 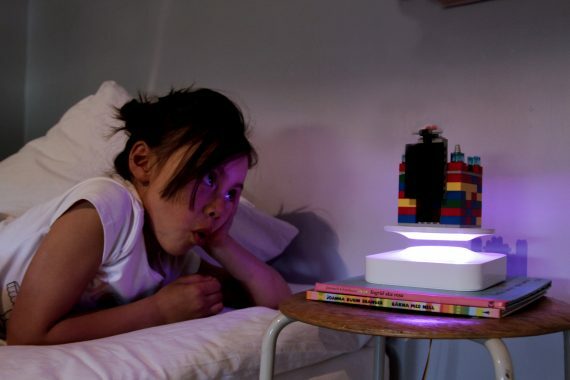 Dream Play empowers children to confidently cope with nightmares at an early age, improving their relationship with sleep and increasing the quality of life for both them and their parents.